Considering I like eyeshadows so much, I decided do a series with swatches from some of my favorite/must-have brands, but as it turns out with all my plans, things don't always work out the way they are supposed to. So, the brand I am starting out with is one I don't own a single eyeshadow from - Bobbi Brown! I had only tried the Bobbi Brown palettes so far, and I didn't find them pigmented enough to show up on my darker Indian skin. Recently, though, I tried the single eyeshadows, and a lot of them seem quite good. I haven't made up my mind on which ones to pick up, but for now, I got some swatches to share. Bobbi Brown Eyeshadows - used a sponge applicator hence the more pigmented swatches. 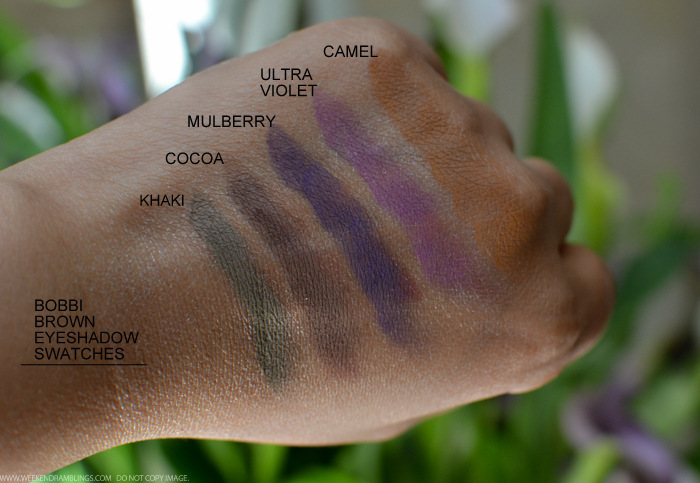 There are a few more Bobbi Brown eyeshadows that I need to share swatches of, but to avoid getting this too pic-heavy, I have added in colors that I liked the most in this post. Of course, these are very biased picks since my idea of a good eyeshadow color is anything in the brown-grey-khaki family :D Not all the colors are pigmented, and some are quite powdery too, but just going by my experience with swatching, the ones on my wish list are Gunmetal and Burnt Sugar. I loved Midnight - would easily be my favorite color among the ones I have tried so far - but blue shadows just don't seem to work on my skin tone, so I am going to stay away from this one.